Google Apps For Education (GAFE) offers great opportunities for collaboration and connecting students to other students in the world. However, in division one, this is not always easy due to students' skills. Google Hangouts offers a simple way to connect your classroom to other classrooms through a webcam. There are actually three types of Hangouts. You can do instant messaging/chat. You can do a Hangout video call. Finally, there is Hangouts on Air which is when you broadcast your video call. This post will focus on the video call hangout. To participate in a Google Hangout, you will need a gmail address or a GAFE email address. The person/class you are connecting with will also need a Google account. To connect with another person/class you will need to be Google+ contacts with them or you need their gmail address. You can use a built-in camera on your device however an external webcam usually offers better quality. The first time you use the camera, you may be asked to "allow" it in a pop-up window. You can use the built-in mic in your device. If your desktop computer does not have one, then you will have to use an external one. The first time you use the microphone, you may be asked to "allow" it in a pop-up window. You can use the built-in speakers from your device. However, sometimes you will get feedback or echoing, so you may want to use external speakers that you can move to limit this. If the conversation is one-to-one consider using a headset mic. If you have a poor internet connection or slow computer speed, you can adjust the bandwidth. The lower the bandwidth will also lower the quality of the Hangout. The same process can be used with Google Hangouts. Watch the video below to see how it works. Please leave a note in the comments for other events and opportunities! 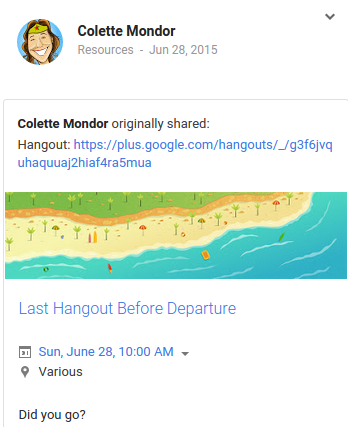 This summer I had an opportunity to see how division one teachers have used Hangouts in combination with other GAFE resources to connect their students with others. A class from Alberta connected with a class from Illinois through Google Docs and Google Hangouts. This summer I participated in Project Overseas. My team was made up of teachers from Ontario, New Brunswick and Alberta (me). Prior to leaving we needed to collaborate and plan. We used monthly Hangouts as a way to communicate face-to-face. It provided a much easier and effective way to collaborate before we left than by only using email. Anyone who has used technology in class, from old-school overhead projectors to iPads, knows problems WILL happen. Sometimes these are avoidable (properly charged devices) and sometimes they are inevitable (light bulb dies). Using Google Hangouts is no different. There are some issues that are avoidable, if you know what to plan for, and some you will have to deal with when they happen. One thing I like to do to be proactive is do a test Hangout with the teacher I'm connecting with before we connect during class time. What timezone is that again? My student teacher learned this the hard way last year. He did not double check the timezone that the class we were going to Hangout with was in. As a result, they were not in class when we tried to call them. Webcams and Microphones - Give Access! When a user first uses a webcam/camera or microphone on a device, the device will often ask for you to allow this. It is a small pop up that sometimes can be missed. If you know your school's internet is going to be heavily used on a certain day, avoid setting up at Hangout for that day. Okay, So How Do I Find Like Minded Teachers? I try not to use my FB account for teaching. However, I am sure there are a number or groups there for Google Hangouts or Skype as well. Please leave a note in the comments for FB events and opportunities you know about! 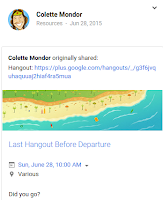 * Disclaimer: As Hangouts has gone through many changes, many of these links do not have updated information.